There is a thrill that surrounds a one-act festival, particularly one so full of local talent: on the stage, behind the scenes, and on the page. Ridgefield Theater Barn’s 9th Annual Evening of One Act Plays presents eight short plays, directed and performed by both seasoned and fresh faces to the theatre, which carry themes of light, laughter, and levity. 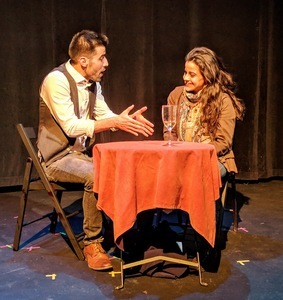 Staged with minimal set pieces and props, with specific lighting and at-times finicky but appropriate entr'acte songs, the Ridgefield one-acts showcased twenty-one actors and seven playwrights’ latest works featuring women’s exploration of love, connection, and personal discovery. Does this sound like nearly every play, ever? Even Brecht? Well, the One-Acts have more than a touch of the absurd too, rest assured. Among them is “Waiting for Hugot,” one of the more head-scratching offerings of the night, by C.J. Erlich, directed by Shawn Tyler Allen, featuring Lori Franzese (with an exquisitely realistic Missourian accent--no “you betcha” pulp there) and Timothy Huber, trying on the madcap, writer-type like a splendidly wacky wig. As the title suggests, this play is not afraid to parade existential themes in reality, and the audience can enjoy the actors letting loose while somehow keeping on solid ground. A equally bizarre offering at the onset is a show about a priest, a teenager, and morning emissions--not exactly a set up for immediate hilarity, but Pat Lennon’s “Bless Me Father” gives it a whirl. Brian DeToma directs this piece with secure footing in the funny, with Larry Greeley as Father David Coughlin Power delivering pastoral pointers with benign boffola, and Daschel Knuff approaching young Brendan with a 50s-era earnestness. Sorta. Taking the fourth dimension for a spin was one of my favorites of the night:“How We Met” by Ellie Martino, although it was not without its frustrating elements. Directed by David Fritsch, the audience is treated to two pairs of actresses who are positively joyous in their craft. 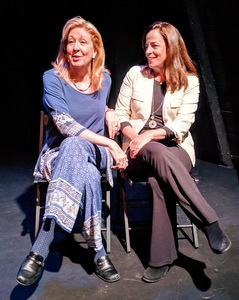 Valerie Huegel and Taffy Miller are engaging in the telling of their endearing story--an effective use of fourth wall narration--with enough humor and heart to carry the play with no other elements. Yet, their story is enacted center stage by their spirit projections (Maya Jennings Daley and Chhanda Som respectively). These two comedic dynamos are relegated to puppets in what plays as a well-crafted improv sketch which is really not necessary to convey the meaning of the piece. Yet, while the audience must keep pulling focus from one wonderful pair to the next, the contrived story device finds the actors delighting all in the telling. A play ready to bust beyond its one act was “Question Mark” by Bob Zaslow, directed with full commitment and attention by Alexis Vournazos. Here the fourth wall narration was more superfluous, as Mark (Stephen Ross) did a fine job in each scene identifying that the perspective of the action was his. A quick character study of his girlfriend Christine (Kristi McKeever) and their delightfully awful stereotyped pairs of Jewish and Irish parents (Elayne Gordon and Craig David Rosen), and of course the magical homeless guy/bartender (Eli Rose), gives us a vast field to watch the actors stretch their archetypal legs in the comedic grass. Meandering throughout the plays is a woman, Eliza (Emily Volpintesta) navigating the search for love with an array of “nope” guys (Chris Cenatiempo) in eight exchanges entitled “Miss Match / Mismatch” by Paulette Layton, directed by Nancy Ponturo. Volpintesta had to maintain an open, earnest Eliza as Cenatiempo presented a plethora of stock characters with impact in a tiny amount of time. While Cenatiempo hit the sweet spot of some of his characters throughout the show, Volpintesta found her stride as Emily in the final emotional exchanges. This is an excellent “front of curtain” piece, and in its present form, works nicely as a scene study collection for new actors. A few plays had that “scene work” feel, starting right at the top with “Kissing Will” by Ginny Reynolds and directed by David Fritsch. Kylie Wolff and C.J. Morsey worked through the piece hitting the beats as close to naturally as possible, given how the play does much more telling than showing. Here is a piece where the actors could choose any number of emotional paths to play these characters, and Wolff and Morsey have the chops to pull it off. “Love at First Sight” by Ed Friedman and directed by Erik Tonner also gave an impression of a perfect scene to work for an acting class--perfect in that it sets up drama from nearly no impetus and pushes the actors to work through their discoveries in rapid, swirling immediacy. This play is written like a sociology thesis, exploring complex concepts of ethnicity, race, and dyschromatopsia (where did THAT word come from?) with scintillating insights and no observable risk of conflict. Rita (Christine Mitchell-Robinson) brings about once-sensitive issues with ease, and Joe (Matt Pagliaro) is well matched for the polite Discussion Tennis that ensues. Also by Ed Friedman is “Secret Dreamers,” another piece where he takes on the challenge of writing beyond the surface and into the depths of women’s psyches, through the lens of laughter. 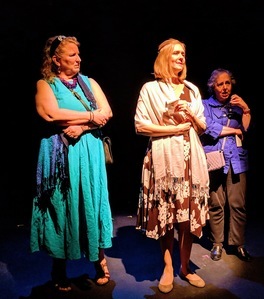 This play is a also a bit of a “unicorn” as it features the rarity of three women over age 50 exploring vitality and viability in the modern world. Elayne Gordon and Cathy Molloy are sisters who embody comedy and drama respectively, and each commits. Sitting in the stillness is their third sister, played by Kristin Aug, whose monologue teased at awkward to land with such elegance and sincerity (fancy French accordion music and elegant lighting choices notwithstanding) that she elicited mid-play applause. RTB’s One Acts are an annual tradition of celebrating the craft of theatre, and this year is no exception. Enjoy this rich night of laughter as tickets are quick to sell out. 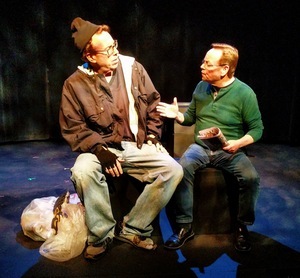 An Evening of One Act Plays runs until March 30, 2019 at the Ridgefield Theater Barn, 37 Halpin Ln, Ridgefield, CT, 06877. Doors open one hour prior to curtain for cabaret-style seating, which is 8PM evenings and 2PM matinees. Bring your favorite treats and libations to enjoy prior to this delightful night full of laughs. Tickets are $35 for adults, and $28 for seniors, students and veterans, and available at ridgefieldtheaterbarn.org or by calling the box office at 203- 431-9850. For more information, email info@RidgefieldTheaterBarn.org. Recommended for mature audiences.